Originally published under the title, "Turks Seeking Export Deals for Helos, Tanks." 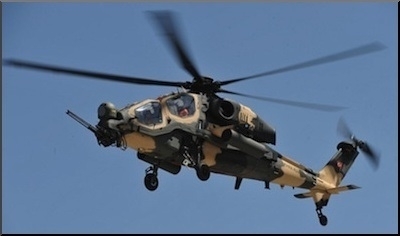 ANKARA, Turkey — Two Turkish defense companies are ambitiously seeking to export their attack helicopters and armored vehicles, chasing deals in Poland and Indonesia. At the IDEF '15 show in Istanbul May 5-8, Turkey's aerospace powerhouse Tusas Turkish Aerospace Industries (TAI) signed two memorandums of understanding with Polish companies, MESKO and WCBKT, to cooperate on KRUK, Poland's attack helicopter program. TAI wants to sell its T129 helicopter to Poland. Last year, the Polish government issued a request for information for its planned acquisition of 32 attack helicopters. TAI is one of the producers that expressed interest in the contract. The others are Airbus Helicopters, Bell and Boeing. "We expect [Poland] to release a request for proposal in the coming days," TAI said in a statement. "Tusas has been having meetings with Polish defense and aerospace companies for possible cooperation on the KRUK program," TAI said. "Memoranda of understanding with MESKO and WCBKT were signed within that framework. The company will continue on meeting with Polish companies in the future." TAI developed the T129 under license from the Italian-British AgustaWestland. In April, it delivered an initial batch of two machines to the Turkish Army. "TAI faces tough competition in Poland," said one Western defense analyst. "But every contender can win, including TAI." 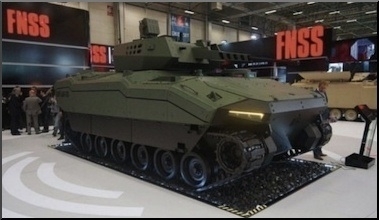 Also during IDEF '15, Turkish and Indonesian governments signed an agreement for the coproduction of the Kaplan, an infantry fighting vehicle (IFV) built by the privately-owned Turkish armored vehicles producer FNSS. Under the deal, the two countries will work to design, develop and produce two prototypes. The deal also involved integration, certification and the production of a vehicle body for mine tests. In 2010, FNSS won a $500 million contract from the Malaysian government for 250 armored personnel carriers. That was the largest ever single export deal won by a Turkish defense company. Ankara-based FNSS is a joint venture between Turkey's Nurol Holding and the US-based BAE Systems Land & Armaments L.P., with the majority share belonging to the Turkish company. The vehicle, the Pars 8x8, is under a coproduction plan with Malaysian partners in Malaysia. FNSS originally developed the Pars for the Turkish military. Turkey and Indonesia took the first steps for cooperation on the Kaplan when the vehicle was launched in May 2013. They signed a preliminary agreement partnering FNSS with Indonesia's PT Pindad. FNSS has technology in a tracked propulsion system while PT Pindad has technology in wheeled propulsion systems. An FNSS official said the company expects to begin producing Kaplans within two years. "All aspects of the program have matured enough," he said. "The new deal will boost FNSS' position in Asian [armored vehicles] markets." The Kaplan is a new generation armored fighting vehicle featuring a 22-25 Hp/ton power-to-weight ratio. It has a low silhouette, and with its twin six road wheeled tracks, can operate in all weather conditions and rough terrain. It also has amphibious characteristics. The vehicle's hull is manufactured and integrated using a ballistic welding technique. The hull is water resistant together with the hatches and lids are water-proofed with seals. Its personnel carrier version can carry eight troops in the rear, and the turreted version can carry six dismounts. Survivability systems such as reduced thermal signature, laser warning system, sniper detection and CBRN protection systems are also applied to the vehicle. The Kaplan can perform armored infantry, reconnaissance, special operations and independent infantry operations missions.